We planted asparagus crowns last year in two trench’s. I’m not sure how long it will be until we can harvest, but they are still growing. We will keep adding compost as the soil in this area is not very good, a lot of clay. This area was dug up several years ago to run sewer line and the clay subsoil ended up at the top. 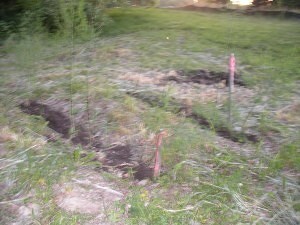 This entry was posted in Gardening, Plantings and tagged asparagus, garden, Planting. Bookmark the permalink.